Super easy to make with only 4 ingredients, yet so filling and delicious! Definitely a perfect oat workout meal, full of protein! Chop asparagus finely in express food chopper (Ninja), mix with egg whites and sea salt. Fry in small pan to make omelet. 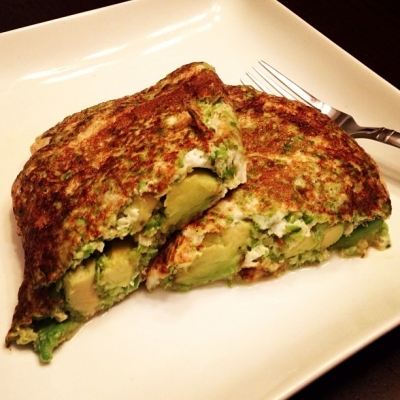 Slice avocado, place on one side, flip over and double fry on both sides! Top with Sriracha for extra flavour.